Throughout history, one of the saddest and darkest realities of religious and ethnic fundamentalism has been genocide. Jews, Christians, Muslims and others have all been victims of religious massacres at each other’s hands, but no such chapter of history has reached the heights of infamy as the Holocaust perpetrated by Nazi Germany under Hitler. Between eleven and twelve million innocent civilians were slaughtered in the Nazi death camps, including six million Jews. The legacy of the most efficient system of mass slaughter in the history of the world now sprawls across Europe: Dachau, Treblinka, Sachsenhausen, Bergen-Belsen, Sobibor and too many others to count. But the blackest of all was the massive death camp of Auschwitz-Birkenau in Poland, where more than one-and-a-half million innocent people, mostly Jews, were slaughtered over a five-year period. This bleak place resounds with the eternal voices of its victims screaming from beyond the grave, ‘Never Again’. The Auschwitz-Birkenau Concentration Camp is a UNESCO World Heritage Site. In the centuries following the Reconquista of Spain and the Protestant Reformation, the flow of Jews to the relative safety of Eastern Europe resulted in large, concentrated Jewish populations in the cities of Southern Poland, Bohemia, Slovakia, Belarus and the Western Ukraine. The period of tolerance for the Jews in this region lasted for many centuries. However, in many other parts of Europe, anti-Semitism was on the rise. This was especially true after the days of Karl Marx, when many believed the Jews to be the backbone of the Communist movement. No one latched on to this belief more ardently than Adolf Hitler, who hated communism with a passion. As the Nazis grew in power in the 1920s, their virulent stance towards the Jews became an integral part of the party platform. When Hitler seized power in 1933, he wasted little time in putting his plans into action. At first, his policies had little effect on the Jews living outside of Germany, though their communities swelled with Jewish refugees fleeing the Fatherland. However, in 1939 Poland fell to Hitler, and over the next two years most of Eastern Europe followed suit. The Jews of the conquered lands were herded into heavily-guarded ghettos where they could be closely watched until the vast network of concentration camps could be erected. On May 20, 1940, the Konzentrationslager Auschwitz opened its doors to receive its first detainees. The first camp, also known as Auschwitz I, originally housed prisoners of war, political prisoners, social undesirables and the like. But by 1941 vast numbers of Jews and Slavs were being shipped in. 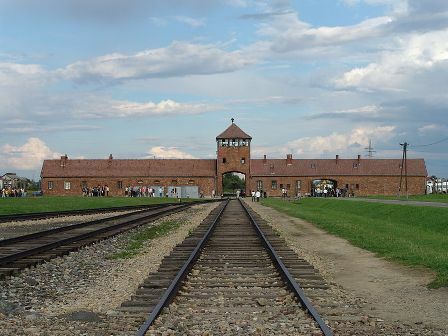 To accommodate them, immense new holding facilities were built at Auschwitz II, or Birkenau, where tens of thousands were housed at any given time. A vast array of sub-camps were established for the purpose of exploiting the available labor. Many of Auschwitz’s prisoners became virtual slaves in the labor camps, whose motto was Arbeit Macht Frei, or ‘work will make you free’. For those who were not chosen to work in the labor camps, the gas chambers were introduced in 1942. As the war began to turn against the Germans, a sense of urgency prodded the Nazis to speed up the pace of the killings. The vast majority of deaths in the various concentration camps took place in 1943 and 1944. As the Russian army approached, the slaughter took on a fevered pitch, as though completion of their horrifying agenda could stave off defeat. When the camp was finally liberated, fewer than eight thousand survivors remained. In the end, for every one prisoner who walked out, two hundred had been butchered. In 1948 a commemorative museum was erected on the site. Both Jews and many Christian groups now consider Auschwitz-Birkenau to be hallowed ground. Most of the Auschwitz-Birkenau Concentration Camp is now one vast museum exhibit. Numerous buildings have been restored to appear as they would have in 1944 at the height of the Holocaust. The iron gate on the front still bears the mocking inscription of work and freedom. Visitors may wander the grounds, visiting the various administrative buildings and barracks. The most soul-stirring and devastating sites are the restored gas chamber and crematorium. Few other places in the world can inspire such deep emotion as staring at the terrifying ovens. Numerous exhibits are spread throughout the various buildings of the camp. Some of these focus on the various ethnic groups that died in the camps, including the Jews, Gypsies and Slavs. There are also rooms full of the former inmates’ personal effects. Another exhibit shows a film taken by the Soviets at the camp’s liberation. In addition to the memorials spread about the camp is the Jewish Center and Synagogue, with an exhibit on Jewish life in Oswiecim before the Holocaust and a resource center. A somewhat controversial cross also stands on the site, erected by a Catholic Church desperate to assuage its own guilt in literally thousands of years of anti-Semitic activity. Before the German occupation of Poland, Krakow boasted one of Europe’s largest Jewish populations. Nearly seventy thousand Jews lived in the centuries-old Jewish Quarter in 1939. By 1943, they were all but gone. Since the war only five thousand have returned. Among the remaining sites is the appropriately named Old Synagogue, the oldest in Poland, and Remuh’s Cemetary, with Jewish graves and a synagogue which date back to the 16th century.